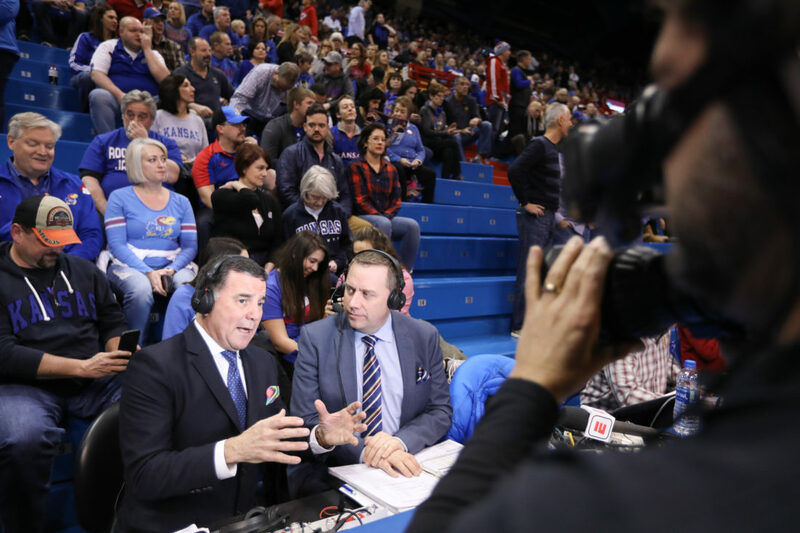 ESPN broadcaster Fran Fraschilla delivers his pregame breakdown, Monday, Jan. 21, 2019 at Allen Fieldhouse. Monday night’s 80-76 win by No. 9 Kansas against No. 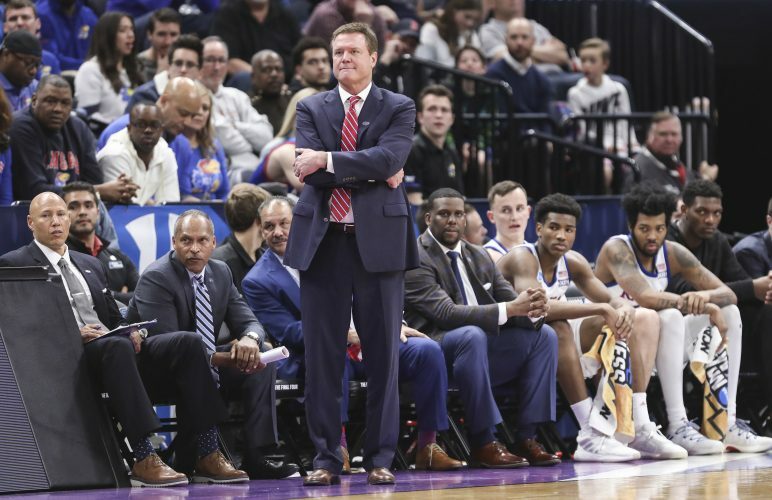 24 Iowa State marked the second of four ESPN Big Monday appearances this season for the Kansas men’s basketball program, a ritual of sorts that has become as common as Kansas returning to Maui every four years for the Maui Invitational. And as important as the Big Monday showcases are to the Jayhawks and their passionate basketball fans, there are people at ESPN who believe the Kansas brand is equally as important to Big Monday. The existence of Big Monday hardly benefits just one side. 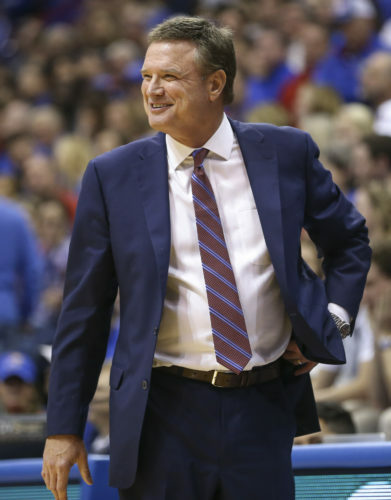 Fraschilla, a former Division I coach himself, said the Jayhawks can use the exposure from the game in recruiting and as a way to add to their already electric environment. 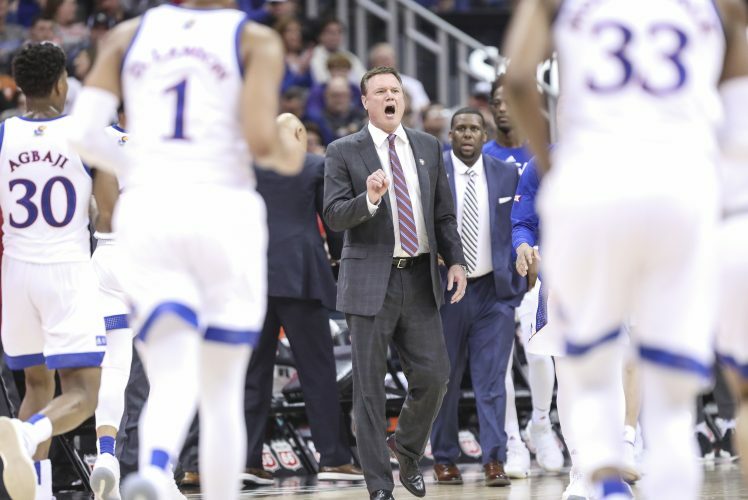 ESPN sideline reporter Holly Rowe, who has reported for dozens of Big Mondays during her career, doesn’t hide the fact that Allen Fieldhouse is her favorite place to cover a game. Like Fraschilla, Rowe also believes that having Kansas as a featured part of Big Monday is a big deal for ESPN. “I think Kansas basketball, in and of itself, is probably the biggest brand, other than maybe Duke, in America. So it is important for us to have this brand in our showcase,” said Rowe, whose first Big Monday broadcast was the Kansas-Missouri showdown in Columbia, Mo., in 2006, when former Jayhawk Christian Moody missed two free throws at the end of regulation in an 89-86 overtime loss. He still recalls the early days of Big Monday, back when Kansas played in the Big Eight and it was the Big East or Big Ten, and not the ACC, that played the 6 p.m. opener. One of Fraschilla’s favorite things about Big Monday is when it takes place somewhere other than Allen Fieldhouse, yet still features KU. “As much as I love coming here, Kansas on the road on Big Monday is cool, too, because they always go into somebody’s lion’s den,” he said. Rowe said her favorite part about Big Monday is the “all eyes on Big Monday” mindset. “If you look on Saturday, there’s 50 games on TV, or maybe more than that,” she said. “So this is a place for the Big 12 to shine and also for us to really showcase the kids and the stories in the Big 12. The Jayhawks dropped from No. 7 to No. 9 in the latest Associated Press Top 25 poll, released Monday afternoon. The Jayhawks were jumped in the poll by No. 8 Kentucky and No. 7 Nevada, but stayed ahead of Virginia Tech, North Carolina, Marquette, Maryland, Texas Tech and Buffalo, which rounded out Nos. 10-15. Tennessee, which Kansas defeated in New York back in November, jumped from No. 3 to No. 1 in this week’s poll after Duke’s loss to Syracuse last week. The Blue Devils dropped a spot to No. 2, with Virginia, Gonzaga, Michigan and Michigan State filling spots 3-6. Before Monday’s game, KU showed a video tribute to Martin Luther King Jr. on the video board at Allen Fieldhouse in celebration of the holiday honoring the great civil rights leader. The video featured a dozen different KU student-athletes, including several members of the Kansas men’s basketball team sharing their thoughts about King and the holiday. “I think it’s important to celebrate Dr. King, because he broke so many barriers in the nation and just allowed people of color to have freedom,” said freshman point guard Devon Dotson. Freshman guard Quentin Grimes was among those to close the video, which included footage of many of King’s most memorable speeches. The coaching staffs for both Kansas and Iowa State participated in an annual event known as Suits and Sneakers during Monday’s contest. Throughout the week, which has been dubbed Suits and Sneakers Week from coast to coast (Jan. 21-27), college and high school coaches across the nation will wear sneakers with their suits during games to raise awareness for Coaches vs. Cancer and the fight against cancer. The National Association of Basketball Coaches (NABC) teamed with the American Cancer Society over 25 years ago to form Coaches vs. Cancer. Since its inception, the foundation has raised more than $115 million to support the American Cancer Society and save lives. 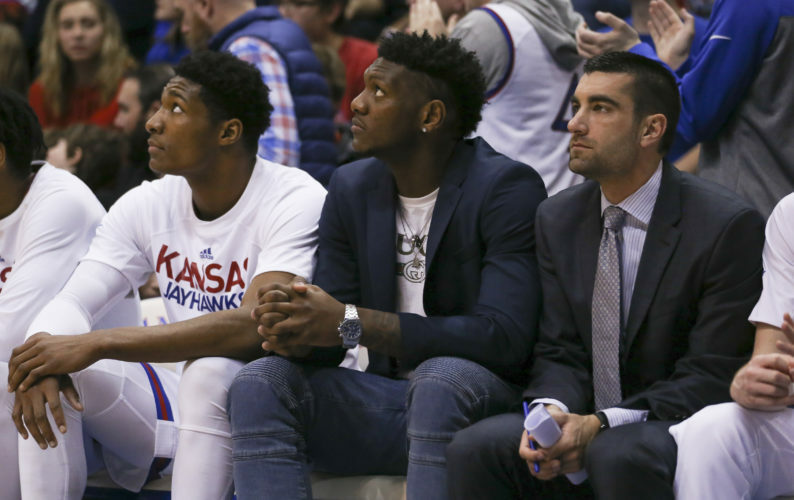 Former KU national champions Brandon Rush, Sasha Kaun and Mario Chalmers watched Monday’s game from behind the KU bench … The Jayhawks are now 16-3 overall and 5-2 or better in Big 12 play for the 15th season in a row … KU now leads the series with Iowa State, 182-65, including a 94-16 edge in games played in Lawrence, 53-10 inside Allen Fieldhouse … KU’s Allen Fieldhouse winning streak is now at 15 games, dating back to the end of the 2017-18 season. The Jayhawks are 11-0 in their home building this season.